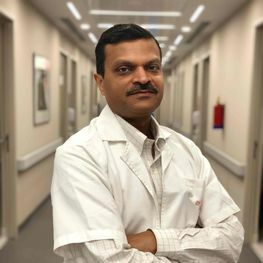 Dr. Vivek Gupta has a rich experience of more than 12 years in cancer surgery across some of the best hospitals in Delhi NCR including BLK Super Speciality, Artemis and Apollo hospitals. He is trained at top national institutes of India like AIIMS and Nizam’s Hyderabad. He holds a DNB in Surgery, a Fellowship in Surgical Oncology as well as a Hepato-biliary Super Speciality Fellowship. His areas of interest include breast cancer surgery, sentinel node biopsy and gynae cancer surgeries.